Easter is one of those holidays that we have come to associate with chocolate - wonderful chocolate. I remember feverishly hunting for chocolates when I was a little girl. I simply had to find more chocolate eggs than my little brother. Every year the girls and I put together a little something special for their cousins. This year I had the crazy idea of mixing all the decadent flavours of Easter together in one sweet spring treat. 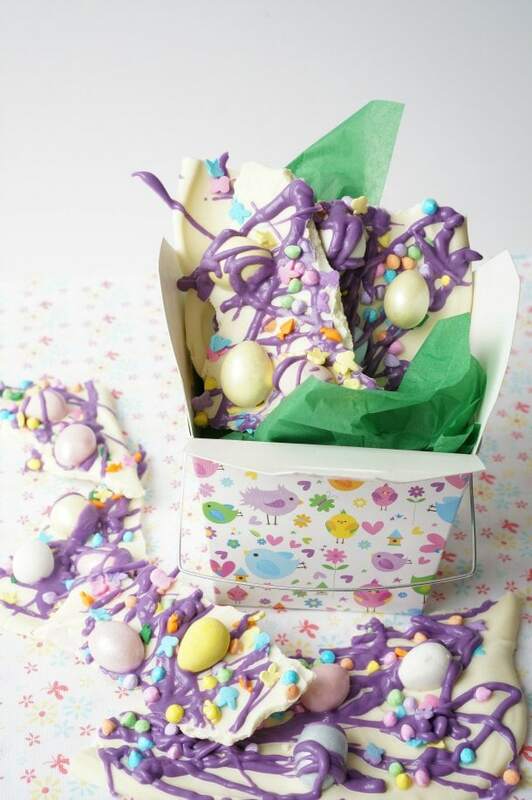 I am almost certain that the Easter Bunny would totally approve of this sweet Easter Bunny chocolate bark. Pour the white chocolate into a heat resistant bowl, place the bowl over a pot with a few inches of boiling water inside (this is called a double boiler). Use a rubber spatula to stir the chocolate. Once the chocolate is completely melted, remove the bowl and set aside. Alternately, melt the chocolate inside a microwave. To do this, place the chocolate inside a microwave safe bowl and turn on high for 15 seconds. Stir. If not melted completely, return to microwave for an additional 10 seconds until the chocolate is melted. Pour the white chocolate onto the center of the parchment paper lined baking sheet. Use an offset spatula to spread the chocolate. Make sure the chocolate isn't too thin, about 1/4 inch thick. 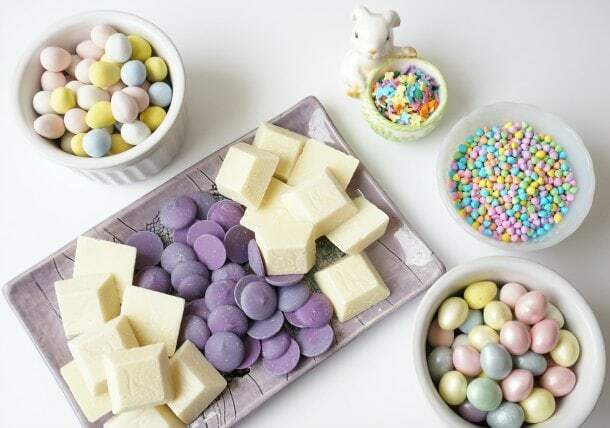 Dot the white chocolate with the Easter candies. Now, place a heat proof bowl filled with the purple chocolate wafers over the same pot of water - bring the water back to the boil. Stir and melt the purple chocolate. 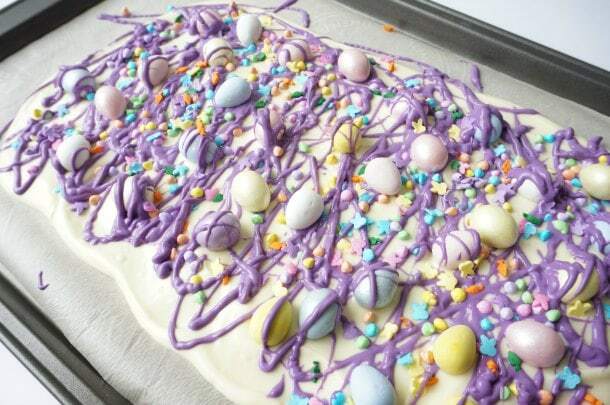 Once the chocolate has melted, dip a fork into the melted chocolate and drizzle purple chocolate all over the white chocolate and Easter candies. Top with more Easter candies. Set aside to cool for a couple of hours until firm. Alternately, cool down the chocolate in the fridge - about 30 minutes. 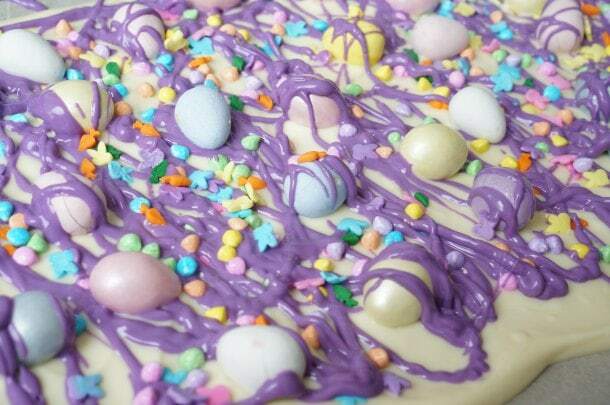 Once the Easter Bunny bark has completely cooled, break the bark into pieces and enjoy. The bark should be stored in a cool, dry spot until you are ready to eat. Storing it in the freezer or fridge would be ideal. We packaged ours up in these super sweet Easter themed Chinese food take out containers that I picked up from our local bulk food store. The girls' cousins are going to love digging into this decadent Easter treat - assuming we don't eat it all before then.